I’d assumed that, because I didn’t run when he told me his secret, he would want the relationship to progress at the same speed and in the same way I did. I was wrong. On our third date Andrew and I go sunset surfing. On our way to the beach I’m uneasy; I haven’t been able to stand up on my board for more than a second, and the Northern California water is so cold. But that day, extraordinary things happen. Andrew tells me when to start paddling. I listen even though the swells look too far away. It works, and I catch multiple waves, standing up for three whole seconds. The water feels like a lukewarm bath, my wetsuit isn’t choking me, and the sun setting behind the Pacific is streaking the sky pink and purple and orange. We carry our boards back to Andrew’s car and start prying our wetsuits off. I try to be modest, holding a towel in front of myself even though I have a swimsuit on underneath. I steal a quick glimpse his way, and am taken aback by the shape of his chest. It’s concave, his sternum like the spine of an open book. Each of his ribs is visible, not an ounce of flab there to cushion them, but beneath his rib cage there’s a round, protruding belly. “Are you cold?” he asks. I nod, and he wraps his towel around both of us and pulls me to him. Our wet salty skins stick together as we kiss, shivering in the middle of the dark parking lot by the sea. We’d met on Tinder, the app I least expected to meet someone on and was mostly using for entertainment. On our first date we’d talked for four hours, neither of us budging to get a second drink or use the restroom or check our phones, totally engrossed in each other. Over the course of four years, I have been on more than 100 first dates. The hopscotch of emotions that comes with dating is second nature to me: indifference transforms into hope, followed by excitement, which gives way to disappointment, which sinks into rampant cynicism before climbing slowly back to indifference. We go hiking and rock climbing and salsa dancing together. We recite poems to each other. We stay up late talking, talking, talking. I search for his flaws, but they remain stubbornly concealed. Maybe this time it’s not just a matter of time until the axe drops. Maybe there is no axe. Being my nicest, most agreeable self feels natural around Andrew, so the same must be true for him. A few months into the relationship, I type out a text to a friend: “I think this is it. The One.” But I hesitate before pressing Send. What if I jinx it? My heart is under so many layers of protection it’s like a tiny Russian doll. Admitting deep feelings means stripping a few of those layers away, and I’m not sure I’m ready to do that. But this one, I decide, is worth taking a risk. I press Send, and my premonition that I’ve finally found the partner of my dreams is launched out into the world. My stomach flips. Then, over breakfast tacos on a Sunday morning, the axe drops. Andrew tells me he has a genetic mutation on his x chromosome that causes his muscles to slowly degenerate. He’s lost three so far: right calf, abdomen, and pectoral. Salsa music plays on the speakers and waiters rush around refilling plastic baskets of tortilla chips. I stare across the table at him, straining to arrange my face into whatever the appropriate expression for this scenario is. The shouts and laughter from neighboring tables fall away. He tells me he was diagnosed after finding, on his high school swim team, that he couldn’t lift his arms over his head to dive into the water. He tells me there’s no way to know how fast the disease will progress or whether it will progress at all; he could be in a wheelchair in five years, or he could run a marathon in his 60s. The condition has a 50% chance of being passed on to any children he has. An hour later he drops me off at home. We kiss goodbye. I smile and wave as he drives away. Then I close the door behind me, sit down on the couch, and dissolve into shuddering sobs. I spend the next 48 hours prowling the Internet for every word I can find on the topic of muscular dystrophy. Medical journals. Support group blogs. WebMD. I discover that the kind Andrew has doesn’t typically impact heart or respiratory muscles, and therefore doesn’t decrease life expectancy. His shoulders will continue, slowly, to curve inward. His facial muscles may go, which would make it hard for him to smile. There’s a 20% chance he’ll need a wheelchair, though the timeline is unpredictable. The question in my mind as I drink in the glowing onslaught of information, more than “do I want to do this?” is “can I do this?” I know I want to be with Andrew. He made the Pacific Ocean feel warm. But do I have what it will take—mentally, emotionally, and physically—to be a loving, loyal companion to him? I decide that I do. I decide that this isn’t a deal breaker. In past relationships I’d dealt with substance abuse, cheating, lying, differing sexual proclivities. Those were deal breakers. If Andrew’s in a wheelchair in 30 years, so what? I’ll hop on the back and we’ll race the bikers down Market Street. I make a mental Do and Don’t list. I must never see myself as a martyr. I must never treat Andrew differently than I would another man. I may not use his disease as a bargaining chip in any situation. I will simply love him, fully and completely. After all, I could get hit by a car or be diagnosed with cancer tomorrow, couldn’t I? The next time I see him, I feel it’s only fair to divulge my own Big Reveal: five years earlier I’d been engaged to a man who turned out to be cheating on me with another man. I’d been blindsided, shattered, had plummeted into a self-doubt from which I wasn’t sure I’d yet fully recovered. With subsequent boyfriends I’d been suspicious and guarded, reading their text messages, digging through their things when they weren’t around. I’d looked forward to the day I’d find a partner so transparent, a relationship so strong, that distrust wouldn’t even occur to me. I tell him that I think I’ve found it, that I’m not going anywhere, and that I want to know everything there is to know about his condition, because he might be The One and that means it’s my condition too. Lying together in the dark that night, wrapped in the cocoon of our mutual vulnerability, I assume the primary hurdle of our relationship has been cleared. Our secrets are out. It’s a straight shot to happy couple city from here. A stone materializes in the pit of my stomach. These are the words of a commitment-phobe. A player. A casual fling. Not my Andrew. For a while I wait and I hope. But as time passes it becomes clearer that, though he cares for me, Andrew doesn’t want what I want. He doesn’t feel what I feel. I could keep waiting and hoping, or I could end it. I choose to end it. Huddled alone on my couch, my face coated in layers of tears, the sense of loss I feel is piercing. How did this happen? Did I scare Andrew off by telling him he was The One? Was I too quick to let my guard down? Or was it not me? Has he decided, deep down, not to get too close to anyone lest he be abandoned when his condition worsens? I realize that, in a way, I’d done just the thing I’d sworn not to do: I’d perceived Andrew through a warped lens because of his illness. I’d allowed myself to believe that his primary flaw was physical, and that this weakness of the body somehow implied a superhuman strength of the mind. I’d assumed that, because I didn’t run when he told me his secret, he would want the relationship to progress at the same speed and in the same way I did. I’d found out something great along the way, though: my love is strong to the core. It doesn’t scare away easily. In my sometimes exhilarating, often terrifying, always soul-stirring pursuit of intimacy, I’ve feared being unloving as much as I’ve feared being unlovable. I feel closer to knowing, underneath the layers of doubt and self-protection that have yet to be peeled away, that I can do it. 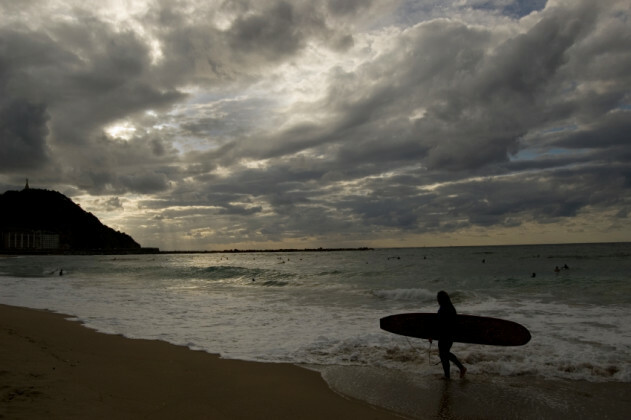 I go back to surfing by myself. I always paddle too late, and the waves plunge me into one nose dive after another. I keep trying, hauling myself back onto my board again and again, until my fingers go numb from the cold. Changing out of my wetsuit in the parking lot, I stare out over the steely vastness of the Pacific.